Strength, discipline and…. 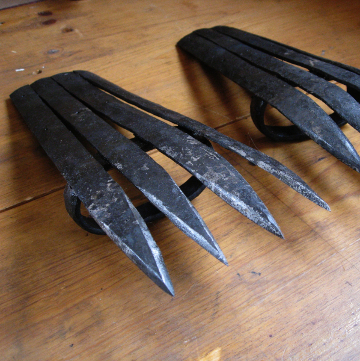 pointy bits? That’s right. Weaponry. You’ve come to the best place on the web right now to read about one of the only people I know who forges and creates weapons from lumps of steel. Read on and enjoy! I have known Matthew personally for probably about 5 years or so, and he is really one of my vendor friends who I always look forward to seeing. He was at the first convention I ever vended at and I see him yearly at Anime North (which is coming up later this month on the 22-24th, so don’t forget to check him out! )and he’s pretty easy to find as his booth design is entirely unique. He builds up a wooden structure that looks like mini traning house, so look for his structure in the hordes of vendors. It makes him pretty easy to spot. 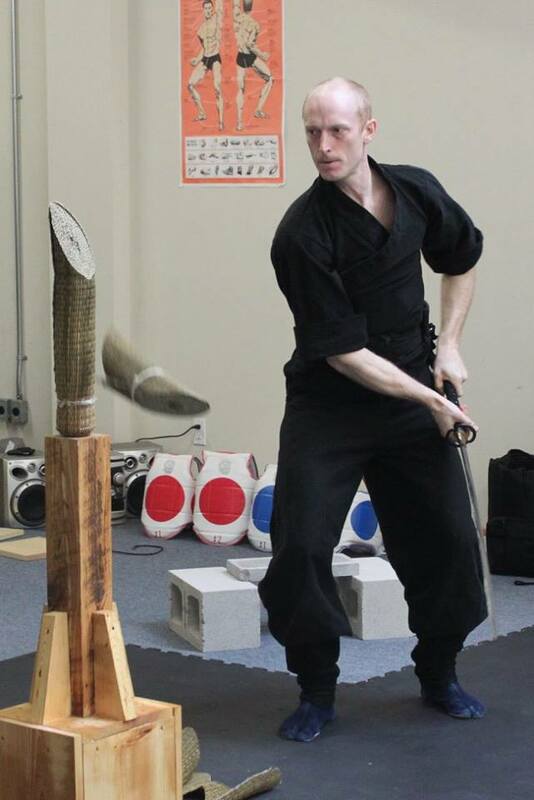 He is the owner of Nine Directions (You can find his facebook page here) which is a company that produces hand made weapons and sometimes, if you ask really nicely, dogus (he also teaches martial arts and really does embrace the lifestyle of his art). I know that we often focus on jewelary and clothing when we’re looking at hand made. Here’s where we get into some really interesting stuff – weapons. This is Matthew wearing one of the dogus that he has made himself. I like to get a little background on the artisan I’m featuring if I know them personally, as this really can make an impact on what they are creating, how they create it and what the finished product looks like. He started with martial arts in 2002 and by 2007 was invited to live as a uchideshi for a year (which is basically intensive training to observe instructors closely – a traditional Japanese training method) during which he studied a different facet of the art every month. When it comes to the fashioning of his weapons and clothing, he hasn’t been formally trained. It is something that came naturally to him though with some trial an error as is what comes natrually with anyone who is self taught. He takes all the information that he can from books and videos and other forgers to create his own unique style. He has now been forging for over a decade and so you can imagine the things that are produced from his forge are quite amazing. I’ve seen a lot of them first hand and I can tell you that they are. I have always had a fondness for weaponry. I used to collect swords and daggers myself, though I have to say, most of what you find these days is decorative, machine made and to be honest, not quite that durable. 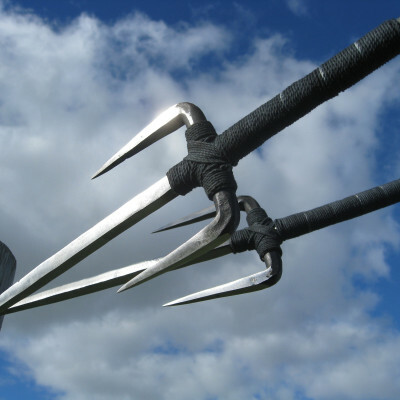 So what makes weaponry excellent? Well there’s a number of things and it does depend on what you’re looking for. Matthew uses a charcoal forge, as opposed to a coke forge (which is what most forgers use to craft their weapons). If you’re like me, and you don’t really know the difference, here it is: coke is the coal equivalent of charcoal. Basically coke is the result when coal gets burned down. Charcoal (not the briquettes that you use for a bbq, but the ones that still look like wood) burns cleaner, hotter and more consistently than coal. If you’re interested in learning more, you can go here. For those of you who aren’t familiar with forging, think of movies like Robin Hood or Game of Thrones when you see blacksmiths making weapons. A big difference between Nine Directions and other forgers is that Matthew does most of his work by hand without using power tools or having assistants help him with bigger tools. He uses the power of his own muscles to shape every piece so there’s a lot of postivie energy and strength that is going into each one. What he does do to keep his strength,accuracy and quality up is he has become an ambidexterous forger switching his hammering arm when he pulls a new item from the forge. This helps him to make a more consistent and more interesting product while improving himself as a tool. When you pick up one of the items that Matthew has crafted you can really feel the quality and the individuality of each. They are heavy and solid and there’s none of this business of separate pieces that shift and move when you hold them as you might find with decorative weapons. These are solid, but this shouldn’t be a surprise with hand made, and they are hand made with such care and committment. 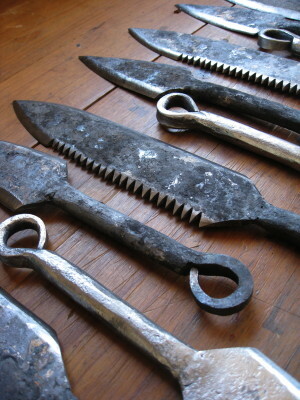 Hand forged sais. Beautiful, yet deadly! Not only does he make weapons but I did mention clothing. Matthew makes traditional dogus (see the photo above) that are fantastically sewn and made out of high quality fabrics. They also look extremely comfortable as he wears them through an entire con. Now I know that this is normally something that you’ll need to request, but let me tell you it’s completely worth it. I do also love to get into business philosophy and with any business owner as I find that people who are driven enough to make their own way have a strong sense of why they’re doing this business – other than being fantastic at it. Matthew prides himself on being as traditional as he can be with the items that he creates and with those he teaches. That he keeps an old art very alive with the things that he makes and in those that he teaches. He noted to me that we live in a peaceful society now, but that this isn’t a reason not to make ourselves stronger and look to better ourselves and our minds and this is something that you can tell has been poured into his work and his personality. If you’re at Anime North in about a week, please take the time and go and see and talk to Matthew of Nine Directions. There is no question that you will find something to appreciate and maybe buy and adopt at his booth. Just remember, any weapons you buy, if you’re staying in the convention, will have to be registered after you buy it, though I know he will tell you the same thing.I will also be at Anime North and if you’re looking for Matthew’s booth and can’t find it, I can direct you to it. Handmade is always so beautiful and it’s so nice to see an art like this available to the mainstream. Please take a visit to his facebook page to see videos, current projects and lots of different photos!